Photo by Charles R. Wolfe. 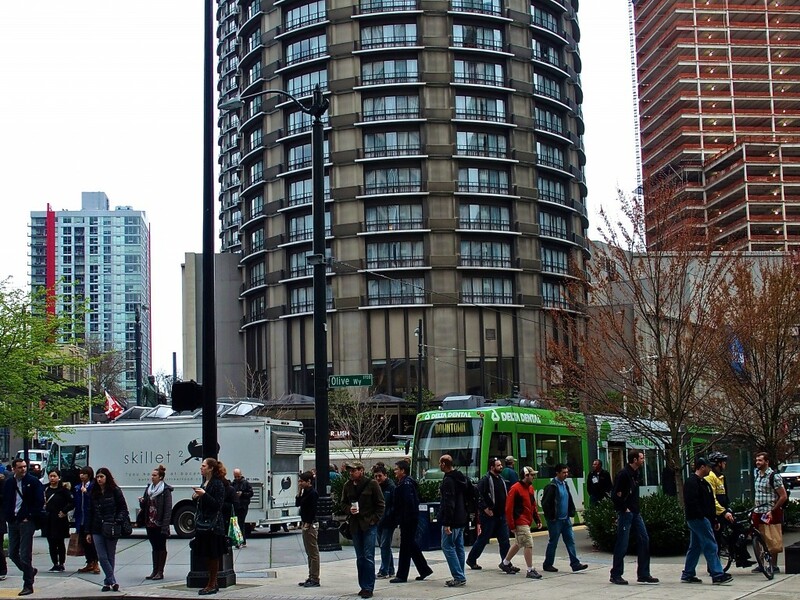 In Seattle, last week, I looked across the intersection of Fifth Avenue and Olive Way, into McGraw Square, and towards the Westin Hotel, noting a Seattle urbanism trifecta—the Lake Union Streetcar, the skillet food truck and one building of Amazon's new headquarters complex under construction. What's not to like about that view? Well, one thing for sure. I saw a ghost, of a missing building from a boyhood memory—something that Amazon might have retrofitted, today, if it were still there for the taking. Gone from this layered, contemporary scene was something significant to the history of Seattle, the Orpheum Theater, demolished in 1967, once the largest theater in the Pacific Northwest, and the temporary home of the Seattle Symphony. Begun as a vaudeville house, the design, by theater architect Marcus Priteca also featured street-level retail, and offices—a reminder that mixed-use development is nothing new. I specifically remember my last trip to the Orpheum, to view the Batman movie from the original television show; notable because local actor Adam West portrayed Bruce Wayne as the winged avenger. But this is not a tale of Batman over streetcars. Nor is this an essay about the retention of historic theaters for the preservationist's cause. Rather, this is a manifesto about the role of purposeful observation and sensation in urban environments, and acknowledgement of the undercurrents and overlaps that form cities today. In capturing the photograph above, as an acknowledged urbanist, perhaps I should revel in the streetcar and food truck scene, with an expanded McGraw Square allowing greater pedestrian use. Instead, I hold that scene in perspective, because I'm old enough to recall what was there before. I'm also an inductive, first person urbanist, always looking for context in what I see. Amid urban change, I see ghosts of bygone images, wondering, ironically, about their unrealized role in today's vitality. This approach, allowing for and explaining the stories behind our redeveloping cities, should not be viewed as antiquarian, academic or obstructionist. For example, similar memories of the native American trail that traveled from Elliot Bay to Seattle's Lake Union, have spurred the Seattle Parks Foundation-led "Lake2Bay" initiative, which endeavors to create a multifaceted urban innovation corridor. I'd like to think urban observation and collective urban memory are as important to the authenticity of urban change today as the oral histories among indigenous people who pass on cultural traditions from one generation to the next. 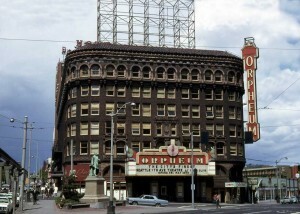 The Orpheum in 1967, photo by Lawton Gowey, featured on Seattle Now and Then. 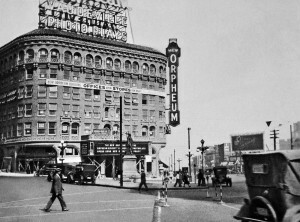 The Orpheum in 1927, photo by John Thomas, featured on Seattle Now and Then. "Looking at and taking messages from urban environments should be as important a research and analytic method as any other that we choose to use, one used in conjunction with others both as a discrete research act and as a constant part of our professional and personal lives." The streetcar terminus could be named "Orpheum Station", at no extra cost, allowing more objective credence to the memory nearby. This is not an ideal preservationist outcome, and really just the old standby of "naming for what was", but it provides continuity now not at all clear to passers-by. Might the spirit of the Orpheum reappear through sanctioned activities in dedicated public space within adjacent new development? Could the vital years of the former theater use reappear in a new light? Similarly, the latent function of the lost space—as a performance venue—could be re-realized in the McGraw Square expanded pedestrian environment adjacent to today's streetcar terminus. Or, consider McGraw Square as an occasional exhibit space on the Orpheum, and the acts and movies that played there. Finally, a more fantastical idea likely never to be realized: Could the city, or a surrounding business, give life to the place-based ghost, and build a full size, temporary front façade of the Orpheum (or a scale model) as part of a series of galvanizing events downtown? It happens in blended photo superimpositions online, such as these examples from London, here and here. Especially if full size, consider the festival aspects of it happening for real. In sum, when framing urban issues, describing cities or developing profiles of a specific place, the detailed variations in the individual perceptions of urban dwellers and observers should not be lost. These subtle messages are often spurred by ordinary urban landscapes, icons, emblems, symbols and "context clues" within ready view, contributing to an understanding of why a place looks and feels like it does today, and what might now be missing but potentially renewed. Charles R. Wolfe is a long time writer about urbanism worldwide and an attorney in Seattle focusing on land use and environmental law. He is author of Urbanism Without Effort and Seeing the Better City.